Riverside players left to right Kayla Nelson, Amy Kegler, Jennah Mittelsdord and Brittney McCullough. BOARDMAN - Riverside hosted Pilot Rock in a Friday night December 12 game. Pilot Rock won 47-31. Pilot Rock held Riverside scoreless for over three and half minutes of the game. A three point shot by Amy Kegler, a layup by Jordan Connell and a freethrow by Kayla Nelson in the closing minutes of the first period closed the gap to 7-5. Riverside continued the momentum into the second period taking the lead of 14-12 at the 2:30 mark of the second period. The Pirates regained the lead again with 1:40 to go in the second. The Rockets reignited and took the lead 20-16 at halftime. Pilot Rock went on a 12 to 3 run in the first five minutes of the third period. The Pirates found their range and scored six points in the final two minutes of the period. Riverside also held Pilot Rock to only one freethrow in the last two minutes of the third period. Pilot Rock had an eight point lead at the close of the third 33-25. The Pilot Rock eight point lead was not insurmountable but the Pirates had to keep a comback momentum going. 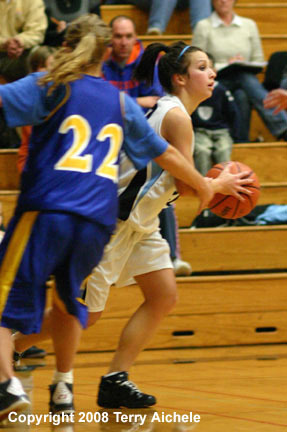 Amy Kegler started of the period hitting a three pointer to close the score to 28-33. Jessica Wallis of Pilot Rock responded immediately with a trey of her own. Pilot Rock defense held Riverside to just six points in the fourth period. The Rockets scored 14 points in the final period to take a 47-31 win. LEFT - Jessica Wallis of Pilot Rock, center, grabs a rebound while being covered by Jennah Mittelsdorf and Brittney McCullough. 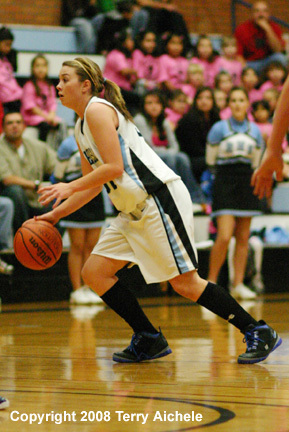 RIGHT - Whitley Reece of Riverside looks for a teammate to pass to. LEFT - Jordan Connell of Riverside passes the ball. 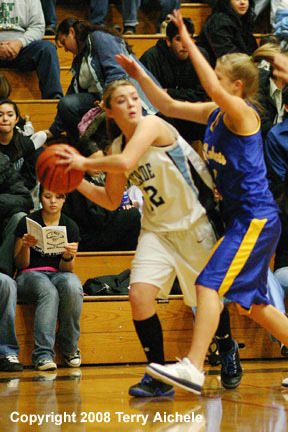 RIGHT - Whitley Reece of Riverside drives to the basket. LEFT - Riverside's Jessica Bradley gets tripped up by a Pilot Rock player trying to control the ball. RIGHT - Pilot Rock's Amylee Perrine grabs a rebound while being closely guarded by Brittney McCullough of Riverside. LEFT - Amy Kegler of Riverside looks for an open teammate while being closely guarded by Shelby Torgeson of Pilot Rock. RIGHT - Jennah Mittelsdorf of Riverside with the ball. 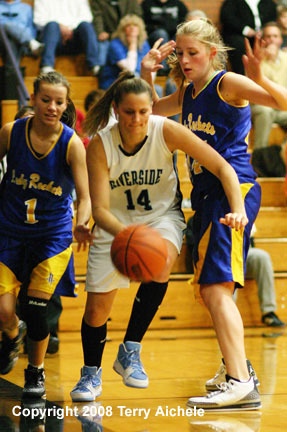 LEFT - Brittney McCullough of Riverside picks her way between two Pilot Rock defenders along the baseline.. 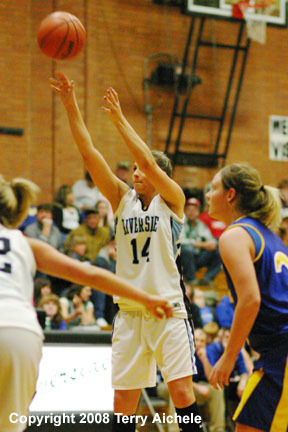 RIGHT - Riverside's Brittney McCullough shoots a freethrow.